As a child, she didn't want to wear it. Now, Mary Martin says she doesn't feel whole without it. Mary, 51, is referring to her prosthetic hand and arm. A congenital amputee, Mary has been a patient of Sampson's Prosthetic & Orthotic Laboratory almost as many years as she is old, first with Bill Sampson Sr. and now with Bill Sampson, company president. Bill recently fitted Mary with a new prosthesis consisting of the High-Fidelity™ Interface socket system and Touch Bionics' livingskin™ hand. Although it is a passive hand, it has functional capabilities that can assist in activities of daily living such as pushing, pulling, stabilizing, supporting, light grasping, and typing, helpful to Mary in her job at US Food Service where she has worked for 20 years. 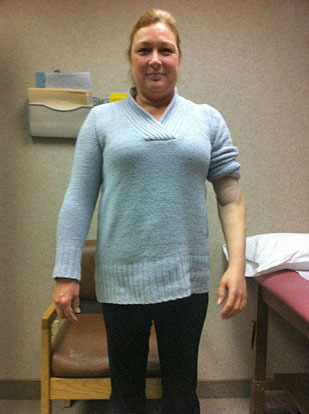 Mary previously was in a myoelectric prosthesis and although it had enhanced functionality, she felt awkward wearing it. When it finally wore out after 15 years, Mary wanted something different. "I asked Bill if there was something lighter than the myoelectric hand. That always felt heavy to me, and I had to concentrate on using my muscles to keep it secure. I really just wanted him to make me something that was more natural-looking and more lightweight." Bill showed Mary a livingskin™ hand he was creating for another patient and she immediately knew that was what she wanted. "Bill copied my hand so it's the same dimensions and has the same markings. The palm of my real hand is reddish; so is this one. I like it. It's very lightweight and looks life-like. It's very comfortable." Although not myoelectric, Mary still finds it functional. "It is easier driving with this one because the fingers are more open and I can put them around the wheel and that is a nice feature." For her socket system, Bill fit her with the High-Fidelity™ Interface from biodesigns inc. Unlike a traditional socket design in which a patient's soft tissue in the residual limb is simply encapsulated, the HiFi Interface is an alternating compression and release design. This results in the socket connecting closer to the bone so that Mary has more control, function, and comfort. Its breathable, open construction offers responsive support without generating excess heat, which Mary appreciates. "With my other socket, I would often get sweaty; it would make my prosthesis slip and I did not feel in control," she said. "With this new system I can actually walk freely, like I'm moving my arms. With the other one I was holding it on all the time. Others noticed that too. When I first started wearing this, they told me I'm walking more naturally and standing straighter, which I was because it was so much more comfortable. Now I can walk without thinking that it is going to fall off." Mary usually makes the most of her prosthesis; her previous one lasted more than 15 years. She expects these newer and improved prosthetic components to be even better. "It's a very natural feeling is the only way I can describe it," she said. "I should have gotten this one years ago. It's so much more comfortable." Livingskin™ from Touch Bionics is designed to be unnoticed by the casual observer. Hand-crafted from high definition silicone and hand-painted to match skin tone and appearance, the livingskin prosthesis is very realistic, including such features as freckles, hairs, and tattoos. Although livingskin is a passive prosthesis, it can also allow important functional capabilities, such as pushing, pulling, stabilizing, supporting, light grasping, and typing. Unlike conventional sockets that simply fit the surface of the limb, the High-Fidelity™ (HiFi) Interface delves deeper to capture and control the bone. This is done by an alternating compression and release design. 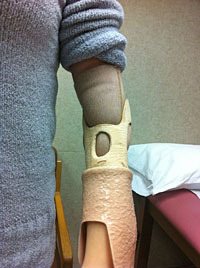 Longitudinal struts apply compression to select areas of the limb and uniquely designed windows between the struts proactively manage the gradual release of displaced soft tissue, enabling volume to safely escape. Because the tissue between the compression areas is allowed to release safely and comfortably, the HiFi feels more snug and comfortable than conventional sockets. Users benefit from better control, less energy expenditure, greater comfort, reduced heat and a greater range of motion.